The Savoy Hotel high tea has been a tradition in London since 1904, and their delicate scones are at the heart of the menu. 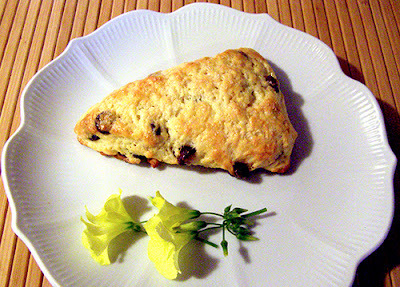 Although Savoy scones are round, and this recipe makes wedges, Allrecipes members claim that the recipe is altered only slightly from the Savoy’s. Who knows, since the Savoy isn’t about to publish its famous recipe. Certainly, one would not see chocolate chips and orange instead of the traditional currants at the Savoy. Those are my substitutions in honor of Valentine’s Day. 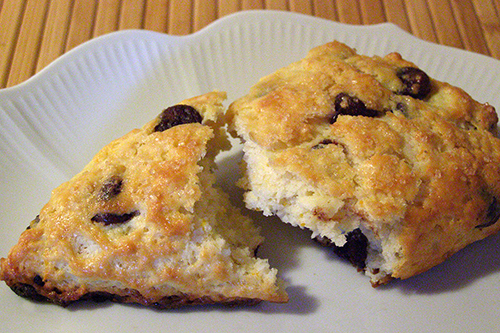 These light and tender scones take only about 35 minutes to make. And they’re vastly less pricey than a trip to the Savoy. If you don’t have chocolate chips on hand, you can use only orange zest, or substitute lemon zest. Currants are traditional in place of the chocolate, and are good with a bit of zest too. Or try raisins, dried cranberries or dried cherries. Finely chopped almonds or walnuts are other possibilities. In a pinch, you can make these scones with no additions except perhaps a teaspoon of vanilla, and serve with a favorite jam and/or the traditional lemon curd. A stainless steel dough scraper, also known as a bench knife, will help enormously in handling the dough without it sticking to surfaces. It’s also the most effective tool for cutting the scones apart and placing the individual scones on the baking sheet. I wish all of you a Happy Valentine’s Day. Enjoy the day and share the love! Whisk flour, white sugar, baking powder, and salt together in a mixing bowl. Grate frozen butter into dry ingredients. 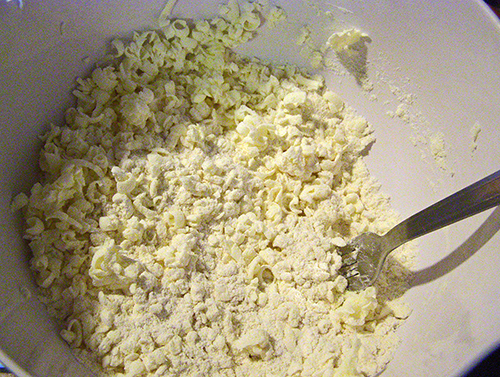 Cut in with a knife or pastry blender until the mixture resembles coarse crumbs. 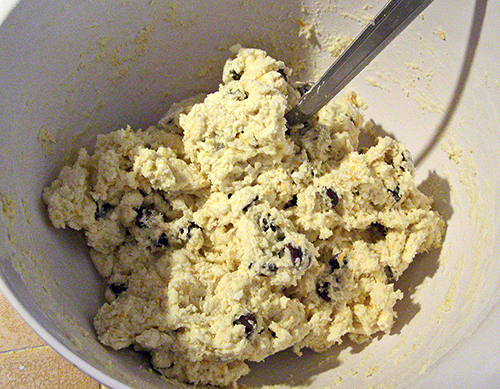 Mix in chocolate chips and set aside. In a small bowl, blend together ½ cup milk and yogurt. Stir in orange zest. Make a well in the center of the dry ingredients. Pour wet ingredients to well in dry ingredients. Stir mixture together with a fork until just moistened and holding together. Transfer dough to a lightly floured surface and pat into a square with floured hands. Use a stainless steel dough scraper to handle the dough to prevent it from sticking and from using too much flour, which will make the dough heavy. 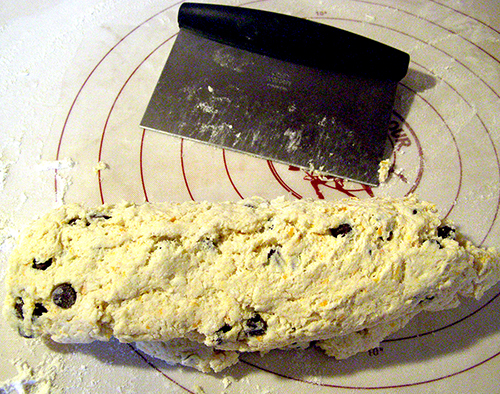 Fold the square over twice, lifting it from the surface with the dough scraper. Turn dough a half turn, gather any crumbs, and re-flour the surface below lightly. 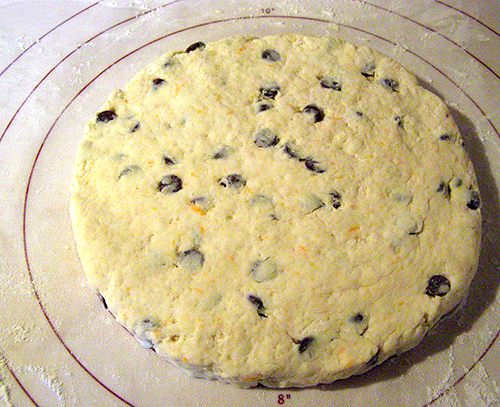 Flatten dough back into a square. Fold twice again, re-flour lightly as needed, and flatten into a circle, ½ - ¾ inch thick and about 8 inches in diameter. Cut into eight wedges with dough scraper. 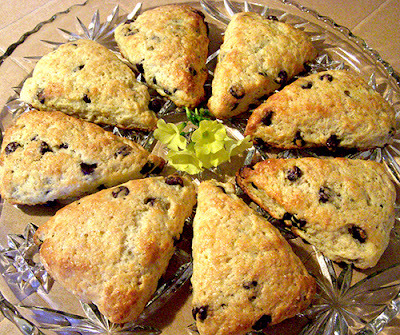 Place scones on parchment-lined baking sheet. Whisk egg and 1 tablespoon milk together in a small bowl. Brush mixture on top of each scone. Sprinkle each scone lightly with raw sugar. Bake scones till risen and golden brown, about 15 minutes. Remove to cooling rack and serve promptly, ideally while still warm.